Yeah I know, I've done a splash from Superman vs The Amazing Spider-Man before, but sue me if this book just doesn't stamp all over the opposition when it comes to flat-out cool comics. John Romita Snr is my favourite Spidey artist, but lately I've been finding Ross Andru vying for the title, and here is no exception. 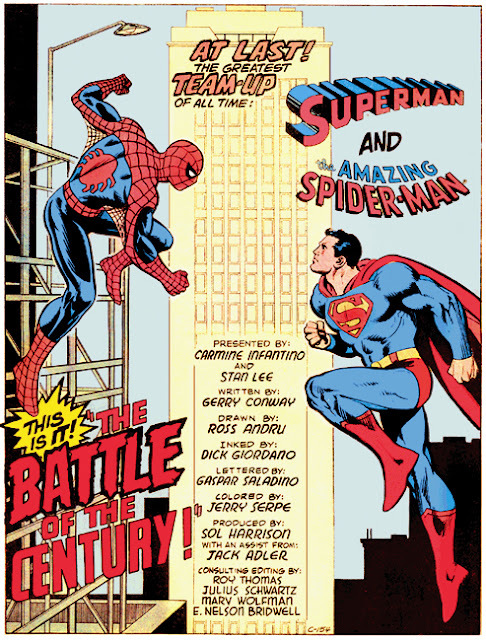 Sure the battle of the century would be sorted with a quick burst of heat vision, but if a Marvel vs DC omnibus could feature these classic show-downs at the size of Superman: Peace on Earth, it would make top-sellers out of these ages old milestones once more. I read this one back in the day and still remember tha WOW factor in it. It was amazing for the story: Lex and Octupus teaming up, but also the fist time little me had a notion on how strong superman could be, when he whitholded his punch on Spider-man for fear of killing him, and Parker still smashed trough a building on the force of the air between Super's fist and Spider's face. It was good fun, and I was hooked. The hair style and the glasses rock. I liked Otto too. It's nor reaaly fair this new version of him.